What Are The Most Common Food Allergies? Do you get stomach aches or discomfort after eating? Are you concerned that you might be allergic to some foods? It's fairly common to have a reaction to food, but there is natural help for food allergies available. Learn more about food allergies and if you might have one. Many people experience reactions to food. We all know that feeling you get after eating something that doesn't agree with you. Foods that are spicy or contain dairy or gluten are often to blame for an upset stomach - but these are not food allergies. In many cases, things like stomach aches and bloating are often related to a food sensitivity. There are other conditions that can be to blame for these symptoms. Food poisoning, irritable bowel syndrome, celiac disease, and sensitivity to food additives can all be to blame for bad reactions to food. But a food allergy is different. Having a food allergy means that your immune system is reacting to something you have consumed. These reactions can go from uncomfortable to severe. According to research from Allergen using data from Statistics Canada, about 7.5% of Canadians have a food allergy of some sort. Symptoms of a food allergy can vary. Some symptoms may be more subtle or irritating. For people who have severe allergies, symptoms can indicate a life-threatening event. When you are intolerant to a food, it means your body has difficulty turning that food into energy. This is very different from a food allergy. 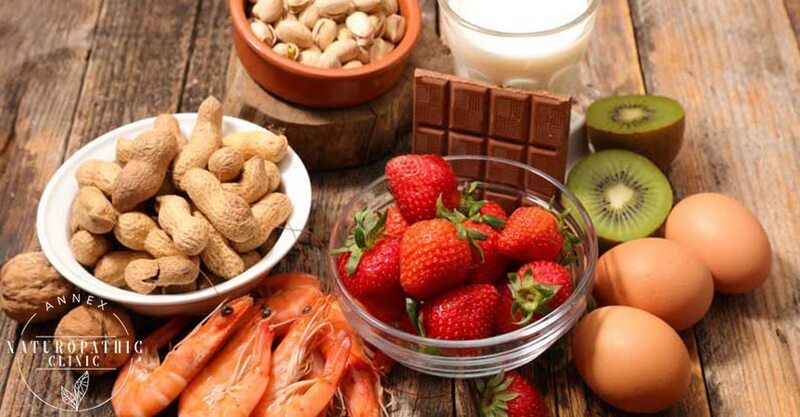 Small amounts of the food you are intolerant to might not affect you at all, but if you do have a reaction, your symptoms may be similar to a less severe food allergy. In contrast, a food allergy means your body's immune system reacts to a food. Your other organs can be affected by an allergic reaction to food. It is a much more serious condition. While some reactions might be minor, in most severe cases you could go into anaphylactic shock, a life-threatening condition. Those who have experienced anaphylactic reactions in the past generally carry an EpiPen, a pen-shaped device that injects epinephrine, or adrenaline, into the thigh. This is generally considered the most effective treatment for anaphylaxis. That's why knowing the common allergies and getting tested if you have had a reaction is very important. There are several common food allergies including: dairy, eggs, tree nuts, peanuts, shellfish, and wheat. You may have one of these common food allergies or a combination of more than one. Dairy allergies usually develop in babies and childhood. This often happens when kids drink cow's milk before they are six months old. While most kids grow out of this allergy by the time they're three, some don't. If you have an allergy to dairy, you must avoid all milk and milk products. This food allergy comes in two forms: IgE and non-IgE. Non-IgE is the less severe form and the symptoms are similar to food intolerance, meaning you have some gut-related issues. IgE cow milk allergies are more severe and common. If you have an allergy to dairy, your reaction usually occurs fairly soon after consuming dairy products. Symptoms for IgE dairy allergies include swelling, rashes, vomiting, and at its worst anaphylactic shock. Like dairy allergies, most children who have egg allergies grow out of them. If you have an egg allergy you may only be allergic to either the yolk or the egg white. This is because both parts of the egg contain different proteins, but most egg allergies are found in the egg whites. In some cases, when the egg protein is changed by using it in a baked good, it can be tolerated. Egg allergies have similar symptoms to diary and if you have one it is best to avoid them. Tree nut allergies mean that you are allergic to nuts and seeds that grow from trees. You may also be allergic to by-products of certain nuts like oils and butters. Unlike dairy or egg allergies, tree nut allergies are usually very severe and if you have one you are unlikely to outgrow it. Peanuts are separate from tree nut allergies because despite their name they are actually legumes, the same family of foods in which you find most beans. The cause of peanut allergies is unknown but there is a potential link to genetics/family history of this allergy. Sometimes parents try to introduce their children to peanuts early on as a protective measure. But if you have a peanut allergy, it's generally as severe as a nut allergy so it is good to avoid all peanut and peanut products. Similar to egg allergies, having a shellfish allergy means your immune system reacts to the proteins found in shellfish and attacks them. This causes a fairly quick reaction that may include stomach issues and vomiting, and in some cases, more severe reactions. If you have a more serious allergy to shellfish, the fumes from someone cooking shellfish may even cause you to have a reaction. If you have a wheat allergy your body's immune system reacts to proteins found in wheat. Wheat allergies can often get confused with celiac disease or gluten intolerance. Gluten allergies indicate that your body reacts to the protein gluten found in many grain products, but a wheat allergy means you can eat gluten products that don't have wheat in them (ie. Barley). Celiac disease is an autoimmune reaction triggered by the ingestion of gluten. Like peanut and tree nut allergies, wheat allergic reactions can be serious and it is important to know if you have one. 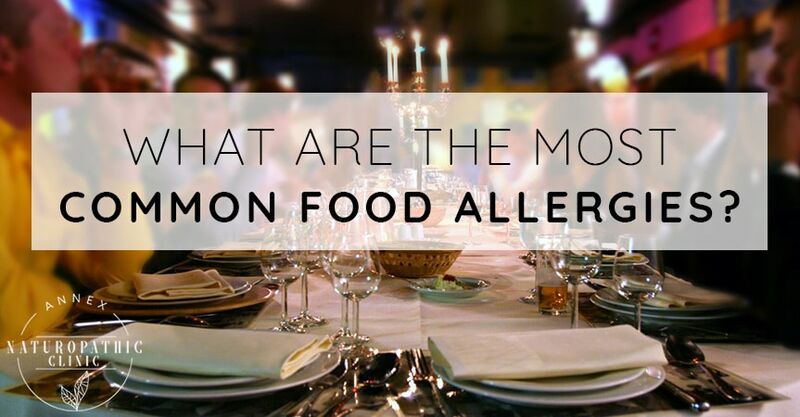 Are you concerned you may have a food allergy? We can help you review your food intake and digestive health history and talk about what natural approaches may help you to support your immune system and gastrointestinal health. Having a healthy stomach and gut will help you lead a happier life.